Thank you for your interest in Flexible Expanding Steel Roller Conveyors. We will be happy to discuss the pricing in more detail with you please fill in your details below and somebody will contcat you back with a quote. Alternatively please call us on 01772 690656 and please reference our part number - Flexible Expanding Steel Roller Conveyors. Flexible expanding roller conveyors extend and bend to your requirements, With a robust construction, these expanding flexible gravity conveyors provide cost effective extending conveyor solutions. They are very easy to quickly manoeuvre in or out of trucks for more efficient, safer, easier loading and unloading. Whether you need an expanding roller conveyor available every hour or just a few times a week, these units will help you to reduce vehicle turn around and thereby increase productivity. The boxes on these mobile expanding conveyors follow the line of the conveyor whatever that may be. So of you want to work around an awkward pillar in your workshop or warehouse, no problem. 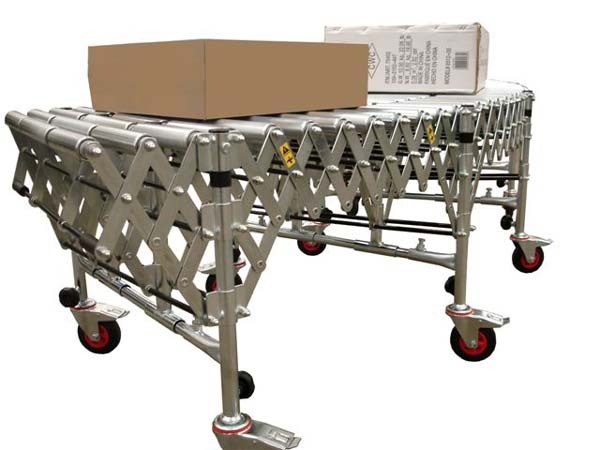 These conveyors are fitted with heavy duty castors for maximum strength and robust mobility, including a foot brake for fixed positioning and safer conveyor handling. Flexible roller conveyors are self tracking. Boxes follow the twists and turns of the conveyor whatever way it’s orientated. Package Stops prevent boxes and packages from falling off the end of the conveyor and can be lowered if required for storage when not in use, or when connecting to another flexible roller conveyor. Standard fully extended conveyor roller centres can be adjusted for small parts by using limit plates but these do shorten the expanded lengths. Please note that optional roller centres will have an effect the conveyors compact length and also the final cost of the conveyor. It’s always best to keep to the standard sizes. Expandable roller conveyors can also be manufactured in custom lengths to suit your individual conveying needs. If your application requires a length that is not listed in the above chart, please call for assistance. We are here to help you get the best value for money. Standard roller widths from 300mm to 1200mm. Steel adjustable conveyor support legs – 450mm to 1500mm in stages. 50mm diameter heavy duty steel zinc plated tube with semi precision bearings. These conveyors are also available with tough high impact plastic conveyor rollers for conveying of more fragile or sensitive loads. Twin Roller Axle Support is jig welded and spans the conveyor width on some models. The one piece ‘Constantly Vertical’ all steel roller and axle support feature ensures maximum strength throughout these flexible roller conveyors.